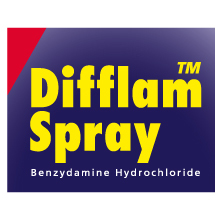 Difflam Spray (benzydamine) is a locally acting analgesic and anti-inflammatory treatment for the throat and mouth. It is especially useful for the relief of pain in traumatic conditions such as following tonsillectomy or the use of a naso-gastric tube; dental surgery. Click here to visit the Difflam website.